iJoy Captain S Coils 0.25 Ohm CA3 | Electronic Cigarette Co. Pack of 3 genuine replacement iJoy Captain CA3 organic cotton kanthal and stainless steel coils 0.25Ω Ohm. Compatible with the Captain S tank. We have trusted suppliers but iJoy isn't currently adding authenticity stickers to their products. Sub-Ohm tanks and coils must be used by experienced and knowledgeable users as additional safety precautions must be practiced when using these items. These products need to work on a mod/battery capable of firing at sub-Ohm resistances. So, for example, if you have a 0.5 Ohm coil in your tank, your mod/battery must be capable of firing at 0.5 Ohm resistance, or lower. You also need to ensure your device can cope with the amps. Improper use can lead to physical injury and damaged equipment. 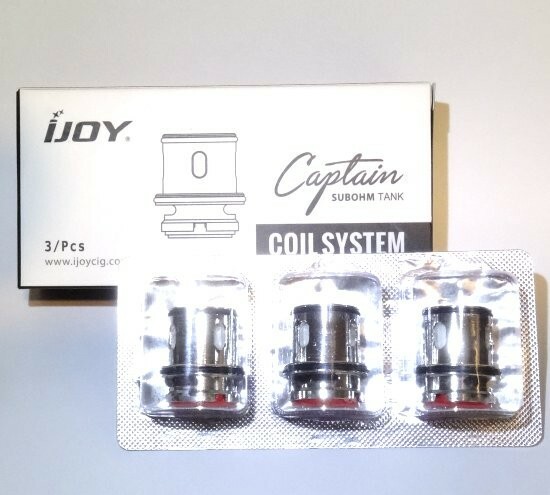 Pack of 3 iJoy Captain CA3 Coils 0.25 Ohm. The main difference between a lower Ohm/Ω coil versus a higher number is that less voltage is required for the lower Ohm. The lower Ohm coil is generally likely to heat faster, produce a warmer vapour and more of it. Use our blog link for more information about what are Ohms and an easy-to-understand explanation about electrical resistance and the advantages and disadvantages of your various options. Sub-Ohm means less than 1.0 Ohm (1.0Ω). 'Priming' is essential to avoid a vile burnt taste and ruined coils. For more information see our blog about priming coils. Please note, this information does not relate to CBD e-liquid or salt nic e-liquids. 65/70% PG - These blends also contain 30/35% VG and they're usually ideal for standard heating coils with a resistance of somewhere between 1.5Ω to 2.5Ω (this number is often written on the coil in small writing). They're often ok down to 1.0Ω but performance will depend on your coil. There is less vapour with PG liquids. 50% VG - these blends also contain 50% PG and they're designed for standard coils with a resistance of 1.0Ω through to 1.8Ω, as a guide. Many 50% VG blends also work well with sub-Ohm coils but it's trial an error and will depend on your coil. This juice blend will usually provide a medium amount of vapour but less flavour if you're not able to vary the power output on your device. 70% VG e-liquid - best suited to sub-Ohm heating coils (sub-Ohm means less than 1.0Ω) and a device with variable power because you will probably need to adjust the output to achieve optimum flavour. Higher VG blends produce a lot more vapour cloud. Use our page link e-liquid blends if you want to know more about thicknesses, viscosity, PG / VG ratios, nicotine levels, vapour production and what makes for a smooth or harsh throat hit, and more or less flavour. This will also help guide you through to suitable e-liquid for your device and help tailor your preferences. Sub-Ohm coils generally require thicker e-liquid, that means more of the VG than PG. It's the VG that produces more vapour and a smoother throat hit. For sub-Ohm coils, the average is a 70-75% VG blend but it's trial an error, sometimes a 50% VG will work well for you, for others it's an 80% VG. It depends on your coils and your set-up and it depends on your personal preferences too. Be aware that 6mg (0.6%) nicotine is often a maximum strength e-liquid to use in a sub-Ohm device. If you can’t take the hit from the increased vapour, turning the power down may cause more problems than it solves, instead you need to reduce the nicotine strength. If you need a detailed explanation about e-liquid, see our best e-liquid for coils article. We also have a lot more really useful information, advice and problem-solving articles relating to e-cig tanks, coils, and e-liquid, and more besides, on our blog. Sub-Ohm tanks and coils must be used by experienced and knowledgeable users as additional safety precautions must be practiced when using these items. These products need to work on a mod/battery capable of firing at sub-Ohm resistances. So, for example, if you have a 0.5 Ohm coil in your tank, your mod/battery must be capable of firing at 0.5 Ohm resistance, or lower. You also need to ensure your device can cope with the amps. Improper use can lead to physical injury and damaged equipment. For more information see our page about sub-Ohm basics. Electronic Cigarette Co (Healthy Start Ltd) offers the original buyer product warranties as set out below, which become effective from the date of purchase. During the warranty period, we will, at our discretion, repair or replace items that are defective. These warranties give the purchaser specific limited rights, in addition to those rights under applicable local law. There are one or two exceptions, therefore, if an individual product page on our website stipulates a specific longer or shorter warranty period, that warranty takes precedent over those below. Our warranties never provide cover for physical damage, misuse, or breakages. Scratches and discoloration from regular use is considered normal wear and tear and is not covered by warranty. Manufacturers are likely to require their serial number before providing a replacement item. This is due to the increasing amount of counterfeits in circulation. Please keep your packaging with the serial number, or take pictures of it before you discard it. Rechargeable e-cigarette batteries, both eGo and 510 style, come with a 28 day warranty and have a life expectancy of anything from 3 - 9 months, depending on usage and brand. The guarantee covers any manufacturing defects and any repairs, or replacements, if deemed to be faulty or beyond repair. The warranty doesn't provide for physical damage, misuse, or general wear and tear. Ensure you treat your battery well. Click here for our e-cig battery problems page for further information. USB chargers, wall chargers, USB car chargers and other battery chargers are covered by warranty for a period of 28 days. Physical damage, misuse, and general wear and tear are not covered. These are consumable items lasting anything from a few days to a couple of months and there is no warranty applicable. Issues with coils are often caused by improper priming, letting the tank run low or drawing too frequently. Please click here for more information about how to prime e-cig coils correctly and it will guide you through to coils burning too. These items are non returnable and are not covered by warranty but defective items will be refunded or replaced. Defective liquids will be replaced or refunded. This applies to e-liquid that is out of date or has a manufacturing defect. The kits comprise many parts and it's the individual parts that would be subject to their individual warranty cover, for example, an eGo or 510 style battery will usually be 30 days. Physical damage, misuse, or general wear and tear is not covered. These consumable items are not covered by a warranty. Expect a typical lifetime of 300 charges when used properly. Box mods are covered for 90 days from date of purchase. The guarantee covers manufacturer defects and any repairs, or replacements, if deemed to be faulty or beyond repair. The warranty does not cover misuse, damage or general wear and tear. The tank itself should last quite some time (usually many months). The heating element inside (the atomizer or coil head) will need to be replaced regularly (1 to 2 weeks on average). Both the tank and the coil heads are covered for faulty on arrival only (DOA). Take great care not to lose the seals on the tank or it will cause it to leak. Please be aware that plastic/polycarbonate tanks are not recommended for use with abrasive e-liquids or particularly acidic e-liquids such as some fruit flavours. Some ingredients in e-liquid can cause cracking, frosting or even melting of plastic tanks. Abrasive and acidic flavours and flavourings include, but are not limited to, absinthe, cinnamon, spearmint, citrus fruit, cola etc. Please bear this in mind if you're using an e-cig with any type of plastic tank. Glass and metal tanks are impervious to these ingredients and are suitable for all e-liquids. There is no warranty applicable but manufacturing faults are covered. Healthy Start Ltd T/A Electronic Cigarette Co makes no other express or implied warranty or condition whatsoever, whether written or oral, and expressly disclaims all warranties and conditions not stated in this Limited Warranty. To the extent allowed by the local law of jurisdiction outside of the EU. Electronic Cigarette Co disclaims all implied warranties of merchantability and fitness for a particular purpose. For all transactions, any implied warranty of condition of merchantability, satisfactory quality, or fitness for a particular purpose is limited to the duration of the express warranty set forth above, and never more than the warranty conditions. Some states or countries/regions do not allow a limitation on how long an implied warranty lasts or the exclusion or limitation of incident or consequential damages for consumer products. In such states, or countries/regions, some exclusions or limitations of this Limited Warranty may not apply to the purchaser. These warranties do not apply to defects resulting from misuse, physical damage, improper or inadequate maintenance, improper charging or use of alternative charging adapters, or unauthorised modifications and tampering. We highly value your feedback. Let us know what you think.